A herb in the mint family with medicinal, culinary ,and ornamental uses. Upright growth with needle like scented leaves. Adored for its long blooming period. Tender shrub with glossy, strongly scented, evergreen needlelike leaves with a flashy light stripe below and blue, lavender, or white flowers. Flowers are borne on old growth in late winter. When grown outside in warm climates, most rosemary cultivars can grow up to six feet high. Prostrate forms creep along the ground. Rosemary has a wide variety of use outside of the kitchen. 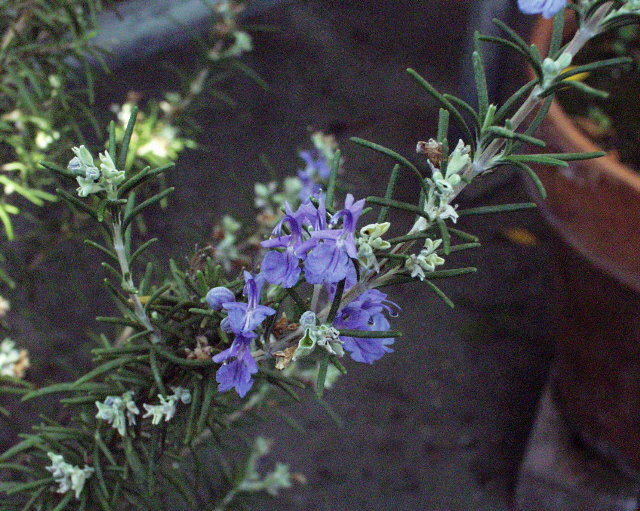 History reveals uses from using rosemary for depression, headaches, muscle spasms, rheumatism, skin ailments and wounds. It was also burned in early hospitals along with juniper berries to "cleanse the air" as it does have some antibacterial effects. The food industry uses the oil as a natural protectant against food spoilage organisms. The antibacterial and antifungal activities have been documented towards mold, Staphylococcus aureus, and E coli. History also reveals it's use as a memory enhancer. According to Dr James A. Duke, "Some evidence suggests that oxidative damage cuased by highly reactive (free radical) oxygen molecules in the body plays a role in Alzheimer's. If that's so, rosemary should help. It contains a couple of dozen antioxidants-that is, compounds that help mop up free radicals." Rosemary oil should be used sparingly since over use can produce poisoning symptoms. Always follow the directions on the containers that you purchase. and Repels Insects with it's agreeable odor. Drink a Cup 3 Times a Day, after meals, of the Brew made from 5 to 10 grams of Romero Leaves to a half liter of water. To Regulate Menstruation: Drink 3 Cups a Day of the Brew made from 50 grams of Romero Leaves to 1/2 liter of water. To Fight Rheumatism and Painful Articulations: Rub the Affected Area with the Tincture made from 20 grams of Dry Romero Leaves, 20 grams of Lavender Flowers to 1/2 a liter of Alcohol; let Macerate for 2 days then Filter before use. To Prevent Hair Loss, Promote Hair Growth and Avoid Dandruff: Rub on Head, Twice a day, with the following Rubbing Alcohol Mixture-10 grams of Romero Flowers and Leaves, 10 grams of Brotano Macho(Cotton Lavender), and 1/2 liter of Alcohol. Mix Well, Let Macerate for 1 Week, Then Filter or Strain. To Cure Sciatica: Rub the affected area with the mixture made from 4 Romero's, 1 liter of Alcohol, Crushed Garlic, Tabacco, Allspice, Beleno(Henbane), Ruda(Rue) and Pirul(Pepper Tree), Verter in a Bottle, Let Heat up outdoors in the Sun, then Rub on affected area until pain Disappears. Complete the Treatment by Chewing a Clove of Garlic in the Mornings,swallow the juice, but spit out the chewed remains. To Repel Insects and Aromatize your Home: You must have a fire proof container that you can hold in your hands without burning yourself. As the mixture smolders,go from room to room in your home. CAUTION: This presentation is not a guide to the identification of plants or their use as a substitute for standard medical treatments. Many plants with medicinal properties are also toxic and frequently FATAL if taken at incorrect dosages or if not prepared in a specific fashion. We do not advocate the consumption of reputed medicinal plant products without prior consultation with your physicianor other natural plant products professional. Consult Your Physician Before Using a Herbal Remedy!